After about 6months of trying I have finally finished my first ever quilt. Ok so that is a slight lie. This is the first one that I started, although I managed to finish a simple 4 square quilt for my grandad’s 90th birthday present. This is the first one I really class as a proper quilt. The top didn’t take too long to pull together but the quilting took a little more work as it has to be done on my mothers machine as I couldn’t find a way to stop the quilting puckering on my machine. It felt as if the foot did not give enough space to allow for the batting. I made the triangles from a mix of fabrics, some from ikea, some from fabricland and even some from a nice coloured duvet I picked up from a charity shop. Having got that sorted it sat for some time waiting for suitable binding. Today I bit the bullet and made some from an old patterned sheet that my grandma gave me at new years. 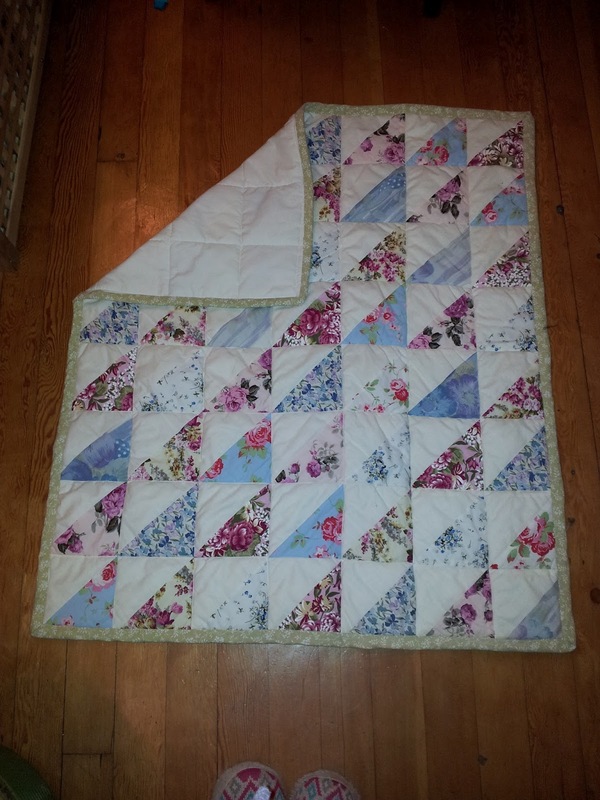 Now my quilt is completely finished and I can use it for curling up in my armchair after a long day!